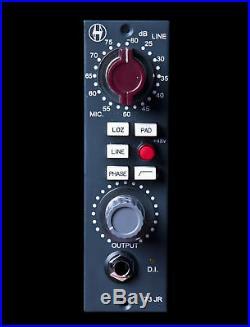 Heritage Audio 73 JR 73JR Junior 500-Series Module Mic Preamp. The mic pre youve been dreaming about, at a price you never imagined possible. The 73 Jr is a chip off the old block, raised on Carnhill transformers and hand wired with care, it delivers the same massive tone as the 1073-500, in single 500 series space. Following his successful big brother, the 1073/500, the new ´73JR is a mic preamp with some added features that will cover all the recording needs for engineers and musicians that don´t find the need to track with eq. Employing only discrete circuitry and conventional components, the 73 junior is a faithful 3 stage all class A 1073 preamp. Styroflex and tantalum capacitors have been used throughout. A useful all discrete class A hi pass filter has been added, essential for recording everything! The Line mode allows for reamping of prerecorded tracks and it´s perfect for adding some class A color to lifeless recordings. The smart switched DI (automatically switches from MIC to DI mode when inserting a MONO ¼ jack) is an all discrete class A JFET circuit ahead of the MIC transformer, so all the juice is there. This makes your lunchbox PSU healthier and makes the 73JR independent of the rest of the slots. 80dB Class A Microphone preamplifier, HI-LO selectable minimum input impedance, balanced and floating. High gain positions show a higher impedance, ideal for old ribbon mics. 50Db Class A Line preamplifier, bridging input impedance, balanced and floating. All discrete Class A Ultra High Impedance J-Fet Direct Input on a high quality Neutrik Jack. The DI circuit is ahead of the Mic Input transformer, so the transformer is ON when in DI mode. DI is automatically switched on when inserting a jack. Class A single ended, 2N3055 driven, high headroom output stage. PAD: 20dB Mic input attenuation ahead of the input transformer to avoid overloading it. HI PASS FILTER: Active all discrete Class A 3rd order Bessel, 80Hz Hi Pass Filter. OUTPUT control to allow overloading of the preamp. Internal slow turn-on +24v power supply for lower inrush current, which improves your lunchbox performance. Carnhill Input and Output transformers. 3 gain stage, genuine modular card construction. All active circuitry is on pluggable cards for easier service. Marconi style knobs and vintage style engraved pushbuttons. Microphone input impedance: HI, 1200 Ohm minimum, LO, 300 Ohm minimum. Higher gain positions gradually have greater impedances, optimum for lo gain ribbon mics. Input is Carnhill transformer balanced and floating. Line input impedance: 10K Ohms bridging, Carnhill transformer balanced and floating. DI input impedance: Greater than 2 Megohms, unbalanced. Output impedance: Less than 75 Ohms, Carnhill transformer balanced and floating, to drive a load of 600 ohms (factory terminated). Maximum output: Greater than +26dBm into 600 ohms. THD: Less than 0.025% at 1 Khz, less than 0.05% at 100Hz. Frequency response: 20Hz (+0.3dB) to 20Khz (-0.2dB). Maximum gain: Slightly greater than 80dB. Merchandise and packaging MUST be in the same condition as when received. Alto Music reserves the right to refuse any return if it appears the item has been used. Software (if unsealed or registered). Harmonicas, Mouthpieces, Earbuds/Earphones/Headphones(if unsealed), or any item that may come in contact with the mouth, ears or nose. There are no warranties for the following items. If a specific listing of ours does not include the "make an offer" button, we are then currently not accepting anything less than the BIN price for that particular item. The item "Heritage Audio 73 JR 73JR Junior 500-Series Module Mic Preamp" is in sale since Monday, October 09, 2017. This item is in the category "Musical Instruments & Gear\Pro Audio Equipment\Preamps & Channel Strips". The seller is "altomusic" and is located in Middletown, New York. This item can be shipped to United States.